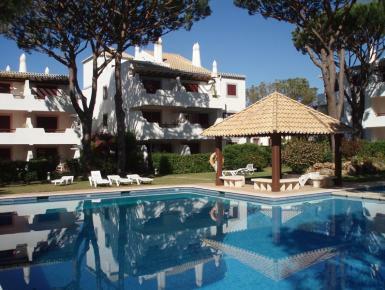 Solar do Golfe is one of the finest apartment complexes in Vilamoura set in large mature gardens on the 13th hole of pinhal golf course a big favorite with tourists from abroad and also from within Portugal itself. It is directly opposite the popular Old Village complex which has a supermarket, bars, and restaurants. The apartment is within private, secure, well maintained grounds which are behind locked gates where there is a weekday administrive prescence, during local working hours, and there is an allocated parking space.